Bill of Lading Labels help you clear customs or give instructions to shippers regarding the contents of shipment. Our premium quality labels will stay securely attached to crates, boxes, plastic wrap, etc. 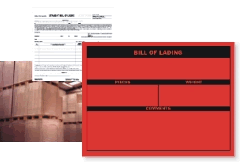 • Fluorescent bill of lading labels get noticed instantly. • Backed by acrylic adhesive, these labels adhere well to cartons, shrink wraps or drums. • Surface is receptive to pen, pencil, or typewriter. • Easy peel-off liner makes application a snap.